Some older reciprocating engine aircraft have been equipped with hand-operated fuel pumps. They are used to back up the engine-driven pump and to transfer fuel from tank to tank. The wobble pumps, as they are known, are double-acting pumps that deliver fuel with each stroke of the pump handle. They are essentially vane-type pumps that have bored passages in the center of the pump, allowing a back-and-forth motion to pump the fuel rather than a full revolution of the vanes as is common in electrically driven or engine-driven vane-type pumps. Figure 1 illustrates the mechanism found in a wobble pump. As the handle is moved down from where it is shown, the vane on the left side of the pump moves up, and the vane on the right side of the pump moves down. As the left vane moves up, it draws fuel into chamber A. Because chambers A and D are connected through the bored center, fuel is also drawn into chamber D. At the same time, the right vane forces fuel out of chamber B, through the bored passage in the center of the pump, into chamber C and out the fuel outlet through the check valve at the outlet of chamber C. When the handle is moved up again, the left vane moves down, forcing fuel out of chambers A and D because the check valve at the inlet of the A chamber prevents fuel from flowing back through the fuel inlet. The right vane moves up simultaneously and draws fuel into chambers B and C.
A centrifugal boost pump is a variable displacement pump. 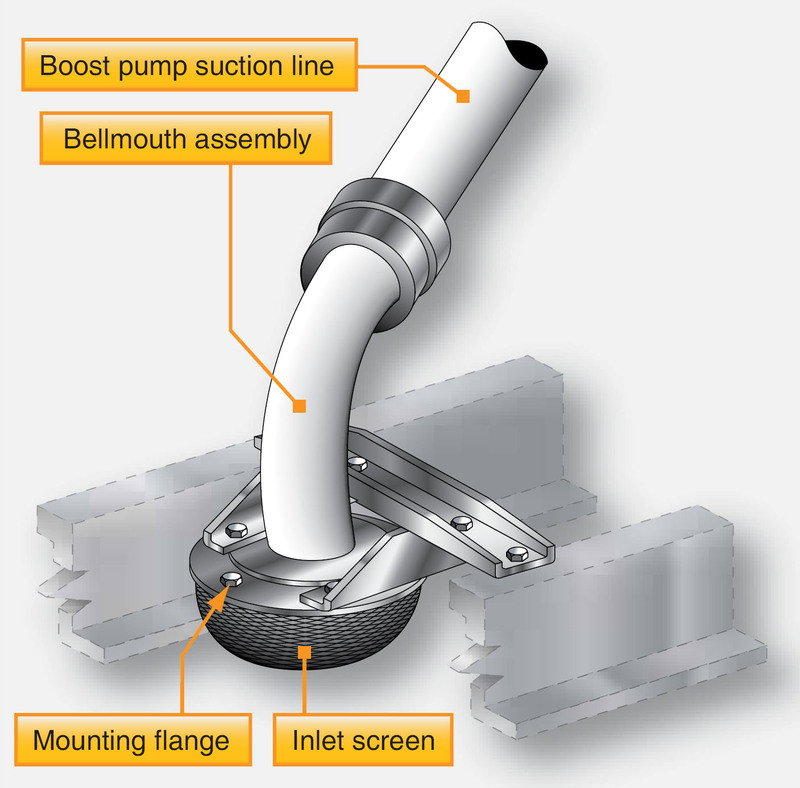 It takes in fuel at the center of an impeller and expels it to the outside as the impeller turns. 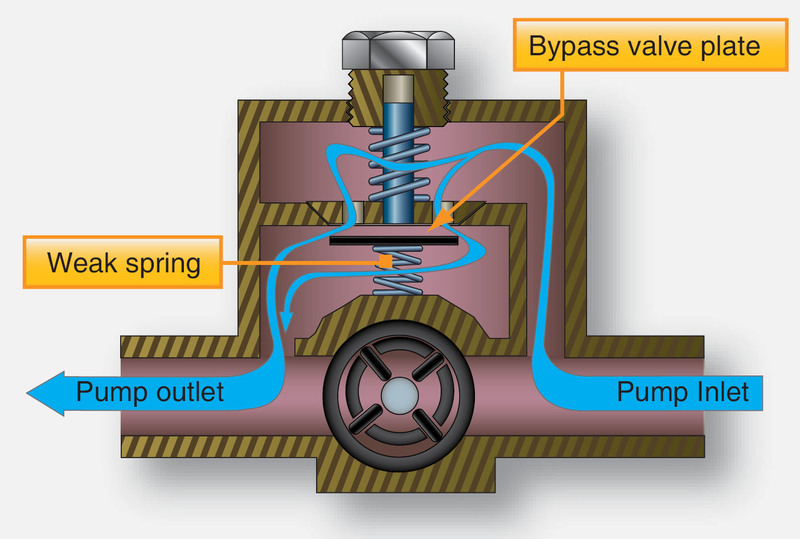 [Figure 4] An outlet check valve prevents fuel from flowing back through the pump. A fuel feed line is connected to the pump outlet. A bypass valve may be installed in the fuel feed system to allow the engine-driven pump to pull fuel from the tank if the boost pump is not operating. The centrifugal boost pump is used to supply the engine-driven fuel pump, back up the engine driven fuel pump, and transfer fuel from tank to tank if the aircraft is so designed. Fuel tanks with in-tank fuel pumps, such as centrifugal pumps, are constructed to maintain a fuel supply to the pump inlet at all times. This ensures that the pump does not cavitate and that the pump is cooled by the fuel. The section of the fuel tank dedicated for the pump installation may be partitioned off with baffles that contain check valves, also known as flapper valves. These allow fuel to flow inboard to the pump during maneuvers but does not allow it to flow outboard. General aviation aircraft often make use of smaller, less expensive auxiliary fuel pumps. The pulsating electric pump, or plunger-type fuel pump, is common. 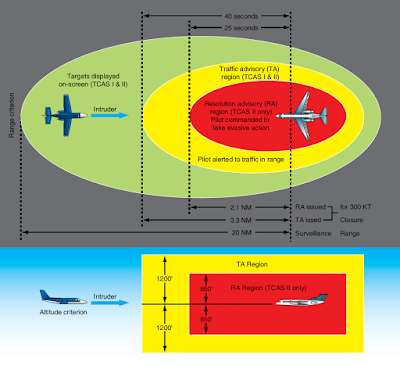 It is usually used in the same manner as a centrifugal fuel pump on larger aircraft, except it is located downstream of the fuel tank outlets. The pulsating electric fuel pump is plumbed in parallel with the engine-driven pump. During starting, it provides fuel before the engine-driven fuel pump is up to speed, and it can be used during takeoff as a backup. It also can be used at high altitudes to prevent vapor lock. The pulsating electric pump uses a plunger to draw fuel in and push fuel out of the pump. It is powered by a solenoid that alternates between being energized and de-energized, which moves the plunger back and forth in a pulsating motion. 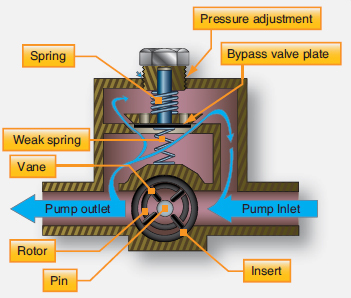 Figure 7 shows the internal workings of the pump. When switched ON, current travels through the solenoid coils, which pull the steel plunger down between the coils. 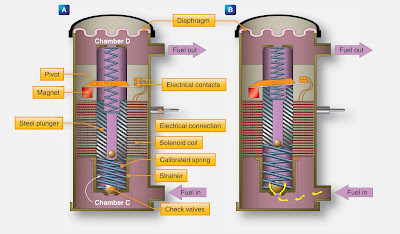 Any fuel in chamber C is forced through the small check valve in the center of the plunger and into chamber D. When positioned between the solenoid, the plunger is far enough away from the magnet that it no longer attracts it, and the pivot allows the contacts to open. This disrupts the current to the solenoid. The calibrated spring shown under the plunger is then strong enough to push the plunger up from between the solenoid coils. As the plunger rises, it pushes fuel in chamber D out the pump outlet port. 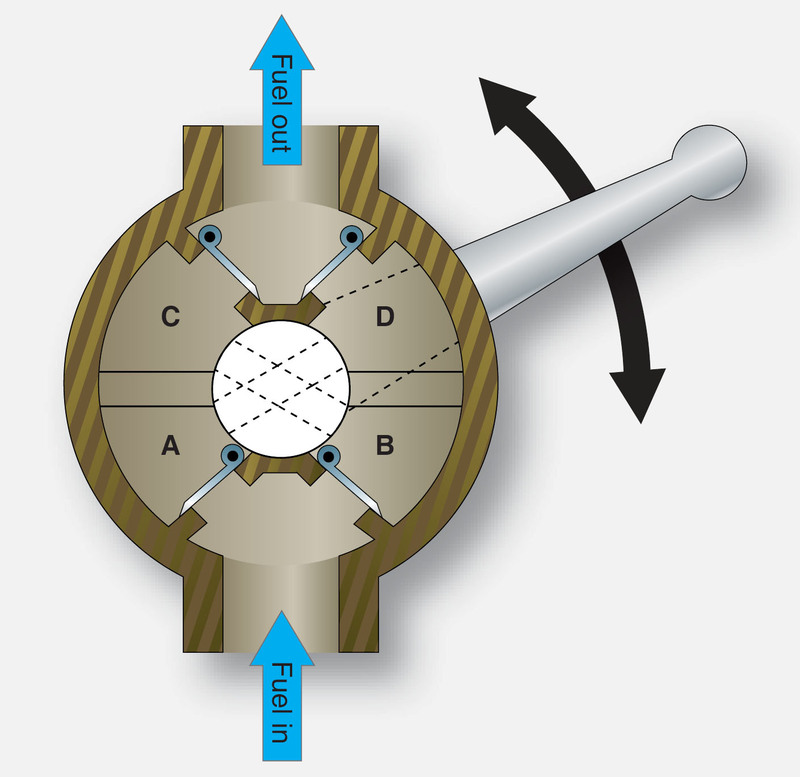 Also as the plunger rises, it draws fuel into chamber C and through the check valve into chamber C. As the plunger rises, the magnet is attracted to it and the upward motion closes the points. This allows current flow to the solenoid coils, and the process begins again with the plunger pulled down between the coils, the magnet releasing, and the points opening. The single-acting pulsating electric fuel pump responds to the pressure of the fuel at its outlet. When fuel is needed, the pump cycles rapidly with little pressure at the pump outlet. As fuel pressure builds, the pump slows because the calibrated spring meets this resistance while attempting to force the piston upwards. A spring in the center of the plunger dampens its motion. A diaphragm between the chamber D fuel and an airspace at the top of the pump dampens the output fuel pulses. 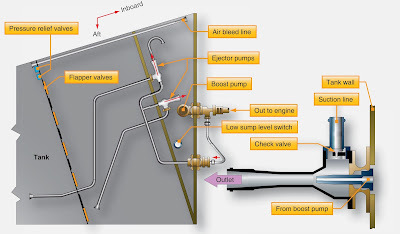 Vane-type fuel pumps are the most common types of fuel pumps found on reciprocating-engine aircraft. They are used as both engine-driven primary fuel pumps and as auxiliary or boost pumps. Regardless, the vane-type pump is a constant displacement pump that moves a constant volume of fuel with each revolution of the pump. 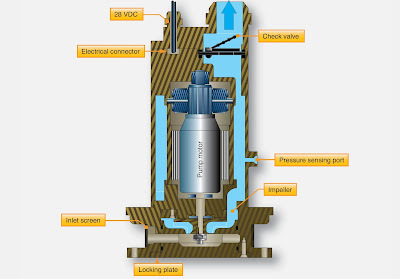 When used as an auxiliary pump, an electric motor rotates the pump shaft. 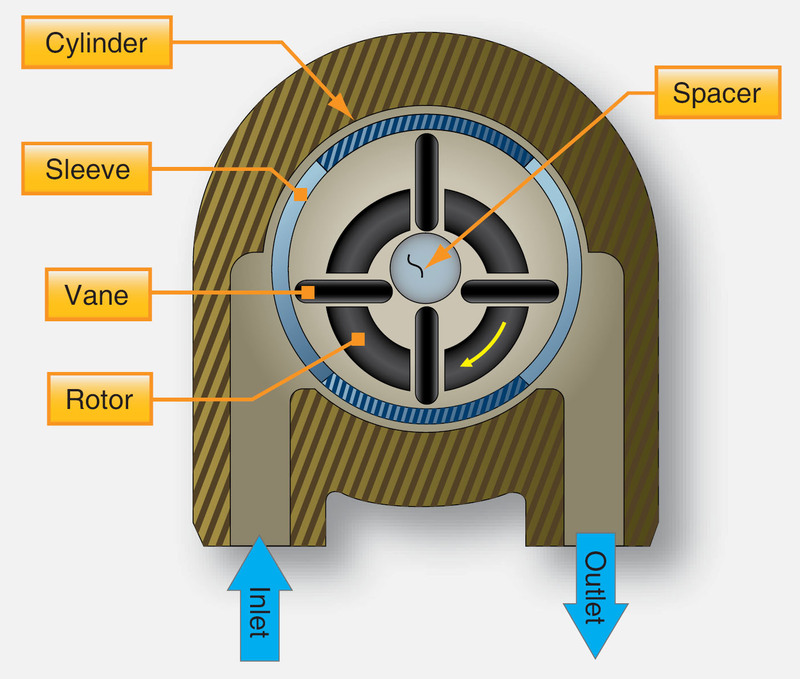 On engine driven applications, the vane pump is typically driven by the accessory gear box. The fuel metering device for the engine delivers more fuel than it needs to operate. However, the constant volume of a vane pump can be excessive. To regulate flow, most vane pumps have an adjustable pressure relief feature. It uses pressure built up at the outlet of the pump to lift a valve off its seat, which returns excess fuel to the inlet side of the pump. 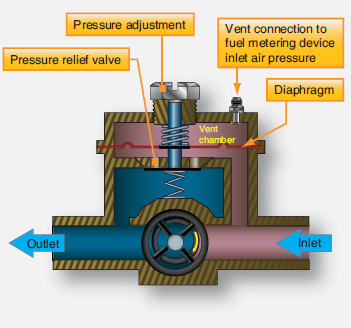 Figure 9 shows a typical vane type fuel pump with this adjustable pressure relief function. By setting the relief at a certain pressure above the engine fuel metering device air intake pressure, the correct volume of fuel is delivered. The relief pressure is set via the pressure adjustment screw which tensions the relief valve spring.